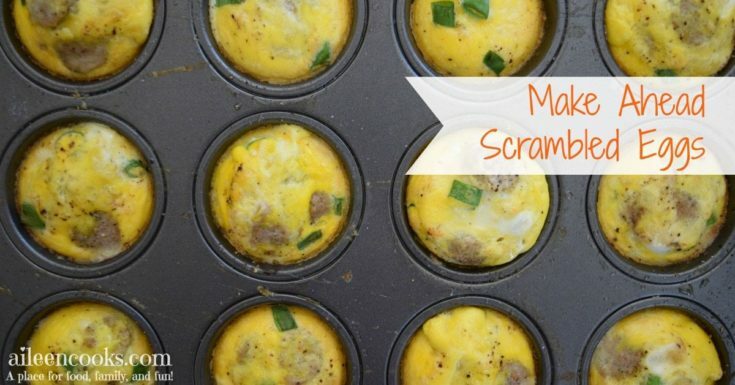 Whether you call them make-ahead scrambled eggs, baked eggs, egg cups, or egg muffins; these simple eggs baked in a muffin tin are perfect for weekly meal prep and can save a lot of time on busy mornings. Breakfast is so important, but it can often be overlooked when you’re busy trying to take care of the rest of the people in your family and make sure they are dressed/fed/clean and ready for the day. 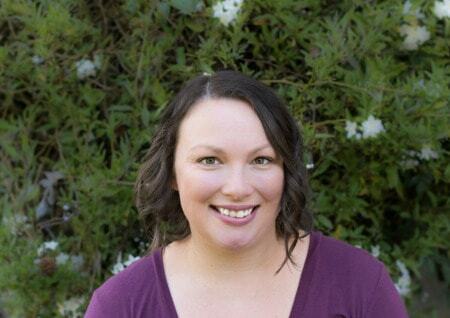 As a busy mom of three, I often find myself skipping breakfast or meals in general. When life gets busy, my needs tend to fall to the wayside. This recipe for make-ahead scrambled eggs helps with my lack of eating habits. It also helps you get out of the house on busy mornings (hello 3 kids 5 and under who all need to eat). 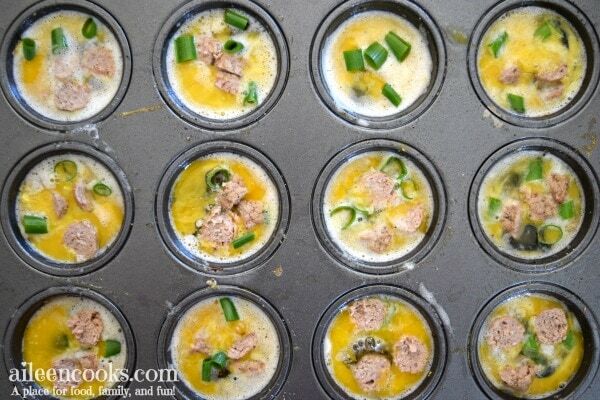 I love that this recipe is customizable, so I can make these baked eggs with whatever I have on hand. You can even add toppings to only half. Or make half of them vegetarian. Caring for ourselves is important and can be done in little increments of time. 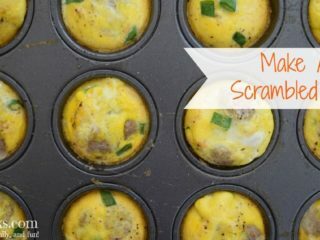 I made these make-ahead scrambled eggs while I was doing my slow cooker freezer session the other day (14 crockpot freezer meals in 1 day!). You can totally prep and bake these eggs muffins while doing other things in the kitchen – or around the house. Then you’ll have no excuse to skip breakfast. Sometimes, I will prep these make-ahead scrambled eggs for the freezer right alongside a batch of freezer-friendly breakfast burritos and freezer friendly breakfast sandwiches. 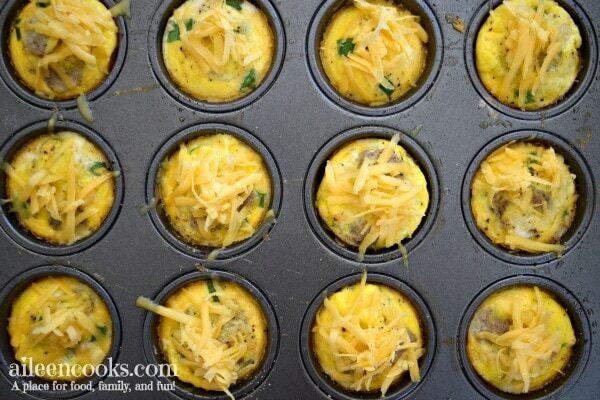 Start by lightly whisking an egg into each of 12 muffin tin slots. Pop into a freezer bag and put them back in your freezer. 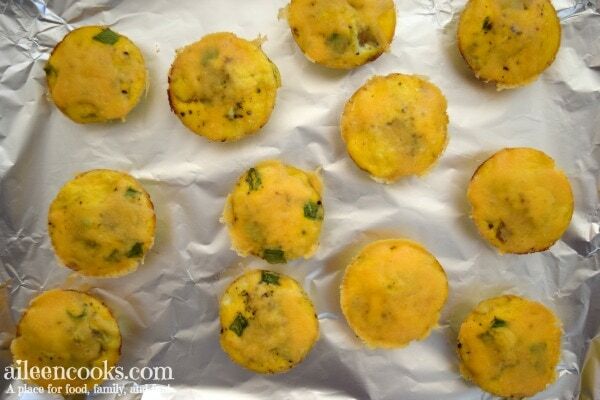 Pull the egg muffins out individually and reheat for 1 1/2-2 minutes. Make Ahead Scrambled Eggs are perfect for meal-prep. 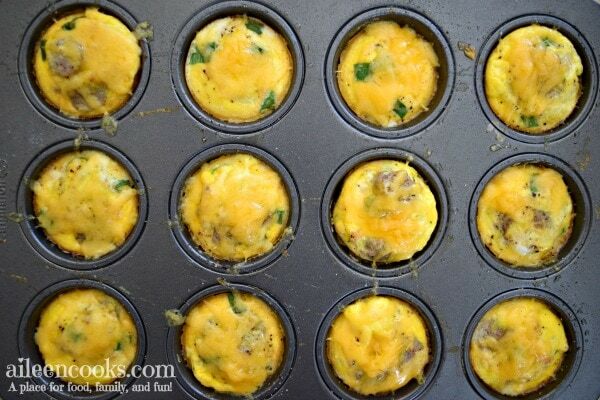 This make-ahead breakfast freezer meal is perfect for busy mornings and can be customized to your tastes. 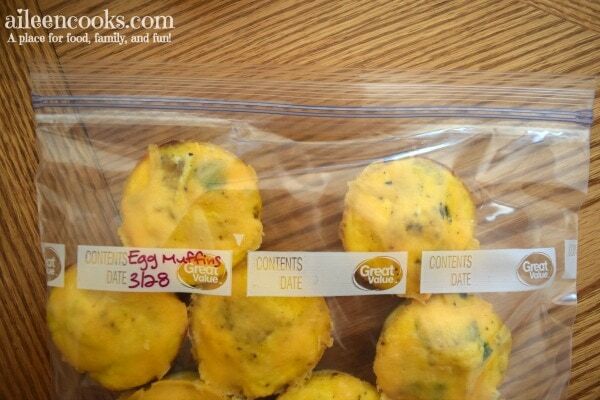 Grease a muffin tin and crack one egg into each opening. 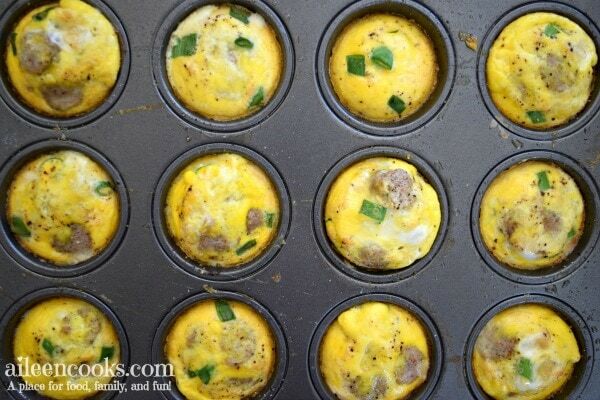 Lightly whisk with a fork and place sausage and green onions in the center of each egg. Season with salt and pepper. Bake 18 minutes, or until eggs are set. Sprinkle each baked egg with shredded cheese. Return to oven for 30 seconds, just until cheese is melted. Place the make ahead scrambled eggs onto a lined cookie sheet in freezer. Once frozen, slide the make ahead scrambled eggs into a gallon sized freezer bag. Label and freeze up to 1 month. To reheat: cook in the microwave for 2 minutes. Did you try this recipe for make-ahead scrambled eggs? Please consider leaving a rating and comment.